iPlay America, an indoor family entertainment and events center located in Freehold, announced several new hires to help lead the facility’s evolving food and beverage team. Center @iPA, and the new Top Golf Swing Suite. Additionally, Mathew Marini has been hired as the manager of Game Time Bar & Grill and Top Golf Swing Suite. He will focus on the overall restaurant experience and leading the front of house staff. Livow’s hire marks his return to iPlay America. He previously served as the facility’s original executive chef back in 2011 and enjoyed a three-year stint with the organization. 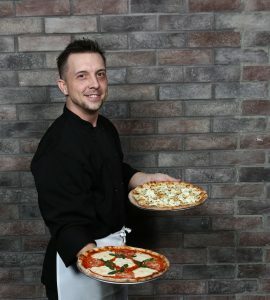 Livow helped establish the success of the culinary experience before becoming a contestant on season 14 of Hell’s Kitchen with celebrity chef Gordon Ramsay. With Livow back at the helm, iPlay says guests can expect to see updated versions of their favorite classic dishes on the new gastropub menu coming soon to the park’s restaurant. The new menu will feature elevated comfort foods made from scratch on premise. In addition to the new menu at Game Time Bar & Grill, Livow will be working with the team at the Event Center @iPA to set new menus and presentations that reflect how events and celebrations have evolved in recent years, providing clients the ability to integrate the theme of their events into the food and presentation. As Game Time Bar & Grill’s new manager, Marini will work with Livow and Hayes to continue to develop the overall direction for the restaurant with a specific focus on the customer experience and diner satisfaction. Marini will also be in charge of all restaurant events and promotions including a variety of sports and seasonally themed events throughout the year. Marini brings to the role 15 years of experience in the food service industry, with a specific focus on the front of the house. He’s served as a restaurant manager and bartender at various establishments in Las Vegas, including time with the world-renowned TAO Group at TAO Asian Bistro and LAVO Italian Restaurant and Nightclub. Most recently, Marini held the position of assistant general manager at the group’s Marquee Nightclub in New York where he supervised operations and staff.